What Makes A Man Think You're "The One"
If you ask men in happy, committed relationships why they chose to spend their lives with one particular woman, certain emotions and experiences will pop up. What is it that makes a man give up his “freedom” for the love of one woman and not another? I’ll tell you. It all has to do with the way you make him FEEL. You know how little boys love comic books and superheroes? It starts when we’re young – we want to feel powerful, we want to save the day, we want to be admired and appreciated. And when we grow up, nothing’s better than feeling that with the special woman in our life. If he’s a good man and you want to make your relationship go the distance, then make him feel like your hero. Compliment him, tell him how much you appreciate him when he does something that makes you happy, and let him know how excited and proud you are to be with him. When you make him feel like a winner who’s doing things right, he’ll want to hold onto that feeling…with you! Men are not that different from you. We don’t want someone coming in and telling us we need to be better or different. Because when a woman wants to change us, it makes us feel that we’re WRONG – and that doesn’t feel good at all. Realize that no person is going to be without things you don’t like, just like YOU’LL have parts about you that a man isn’t thrilled with. The key is looking at the whole package in a man and loving all of it – even if you sometimes don’t like some of the individual parts. They’re what make him who he is – and he’ll recognize you’re the woman for him when you love him for ALL of it. Unlike women, men don’t tend to talk through their feelings with each other. They save that for the one special woman in their lives. So it’s a great sign if your guy wants to talk with you about what’s bothering him when it comes to his life, his career, his family, and his day-to-day stuff. Your job is to listen without judgment – to be there for him and to offer your advice if he asks for it. If he keeps talking, it means he feels comfortable and safe with you, and he’ll begin to think he can tell you anything. You want to be that safe landing spot for your man – not just because it brings you closer together, but because he’ll recognize he has a woman who truly understands him. A man feels compelled to get closer to you and spend more time with you as a result of the experiences he has with you – the POSITIVE experiences. He’ll start to feel like your relationship – and, by extension, his life – is easier, better, and more fulfilling. So focus on building a solid foundation with him by creating positive experiences together. Do fun and different things with him. Get to know each other in a variety of contexts – both alone and with friends and family. When he sees how well you fit into his life and how much joy you bring him, he’ll see you as a necessary part of his life – one he’ll never want to be without! If you want to understand the kind of deep attraction that’s absolutely critical to creating a connected, lasting relationship with a man, click here to subscribe to Christian Carter’s FREE e-newsletter. Chirstian’s eBook “Catch Him & Keep Him” is fantastic, it transformed my whole view of attraction and the way men think when it comes to dating and relationships. To check it out, click here and then click on “Program Catalog” in the top right corner. 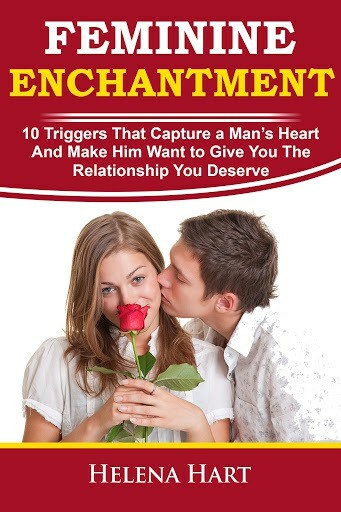 In this book, he’ll explain EXACTLY what makes a man want to commit to you, and what you can do to get him there without any convincing or game playing! 1 Response to "What Makes A Man Think You're "The One""